The federal Department of Transportation has issued its latest round of its Transportation Investment Generating Economic Recovery (TIGER) grants for cities and states around the country. The grant program was created in 2009 through President Obama’s economic stimulus package and has since provided $3.5 billion to 270 projects. While the DOT has not officially announced the recipients of these new grants, which total $600 million, multiple politicians have been touting the money heading to their districts. Here are some of the projects we know about so far. 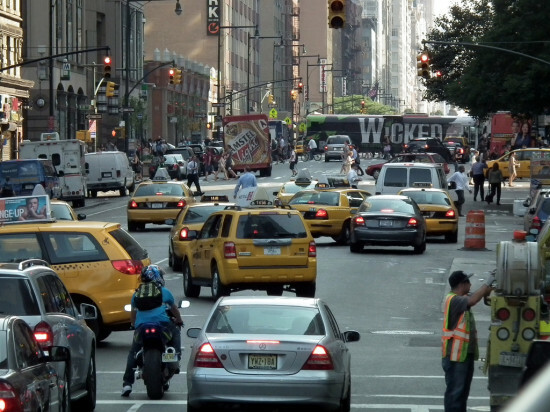 In New York, Senator Chuck Schumer and Mayor Bill de Blasio announced that the New York City Department of Transportation will receive $25 million for its Vision Zero agenda to reduce pedestrian fatalities. 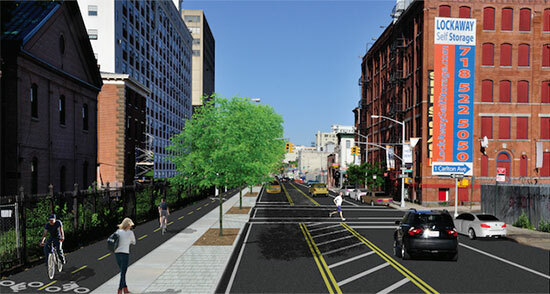 According to the city, the money will fund 13 projects aimed at traffic calming, safety improvements in school zones, new public spaces, and “pedestrian and bike connections to employment centers.” Specifically, the money will be used to extend the Brooklyn Greenway and make 4th Avenue in Sunset Park, Brooklyn safer to pedestrians. In Philadelphia, $2.5 million has been awarded to support the city’s effort to create a bus rapid transit system along Roosevelt Boulevard. “Planned developments on Roosevelt Boulevard include modifications to provide safe pedestrian crossings, transit access, and effective separation of express traffic from local traffic accessing neighborhood destinations,” Pennsylvania Senator Bob Casey said in a statement. In Virginia, U.S. Senator Mark Warner announced that nearly $25 million has been allocated for a bus rapid transit system in the city of Richmond. The Times Dispatch reported that for this project to happen, the federal money must be matched with about $17 million from the Department of Rail and Public Transportation and another $8 million from Henrico County and the City of Richmond. In St. Louis, $10 million will go towards a new Metrolink station in the city’s emerging Cortex innovation district. The funding will cover almost all of the $13 million project which is expected to be complete in 2017. On the other side of the state, in Kansas City, $1.2 million has been awarded for the Mid-America Regional Council’s Workforce Connex planning to study to better connect the city’s workers with public transit. New York Governor Andrew Cuomo has signed a bill that allows New York City to lower its default speed limit from 30 miles per hour to 25. The legislation, which is expected to go into effect within 90 days, is part of the city's ongoing effort to reduce traffic fatalities. Specifically, reducing the city's speed limit has been one of the central pieces of Mayor de Blasio's Vision Zero agenda. "This is another vital step toward making New York City streets safer for every family," Mayor de Blasio said in a statement. "Our Vision Zero initiative’s mission is to save lives, and that is precisely what this legislation accomplishes." With tens of millions of dollars, New York City hopes to jumpstart a transformation of Brooklyn’s Sunset Park neighborhood into a hub for artists and tech companies. As the Wall Street Journal reported, the city is spending $100 million to transform part of the Brooklyn Army Terminal—an old navy-supply hub—into space for light manufacturing. That investment is just one piece of the millions of dollars flowing into the neighborhood from real estate investors. While the money will be significant, giving new life to Sunset Park's industrial corridor will take more than artisanal pickles and startups. It will take great public space and significant improvements to the neighborhood's streetscape. At this point, however, it's not clear if that type of investment is in the cards. About 20 blocks north of the Brooklyn Army Terminal is Industry City, a six-million square foot former industrial complex that currently includes startups, artist spaces, and light manufacturing. The impressive space hosted events for this year's New York Design Week and will soon be home to the Brooklyn Nets practice facility. To continue the building's transformation, a group of investors has purchased a 49 percent stake in the complex and plans to lease remaining space to food manufacturers with connected retail spaces. The idea here is to attract locals and tourists to the site. 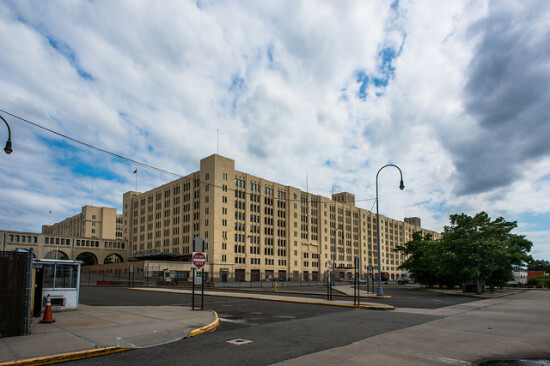 Nearby is the Liberty View Industrial Plaza, another early 20th Century naval supply center, which has received $80 million from some deep-pocketed individuals who want to create affordable space for small companies pushed out of the Garment District. As the Journal noted, all this investment could be muted by the fact that these buildings are pretty difficult to get to from the subway and the neighborhood's residential and commercial centers. "After decades of neglect, roads in Sunset Park are filled with potholes, some sewer lines are aging and walking from the residential areas to the factories requires a nerve-racking trip across the Gowanus Expressway," reported the Journal. 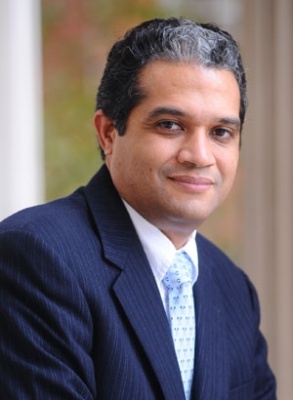 "Fixing all that will require significant investment." The mayor's Vision Zero plan could play a role in making that connection safer and more attractive. The waterfront side of these buildings could use some work as well. Where DUMBO and Brooklyn Heights have the Brooklyn Bridge Park, Sunset Park has concrete piers. There is one glimmer of hope, though. The Bush Terminal Pier Park, the ever-delayed park, which has been under construction since 2009, may finally open this fall. 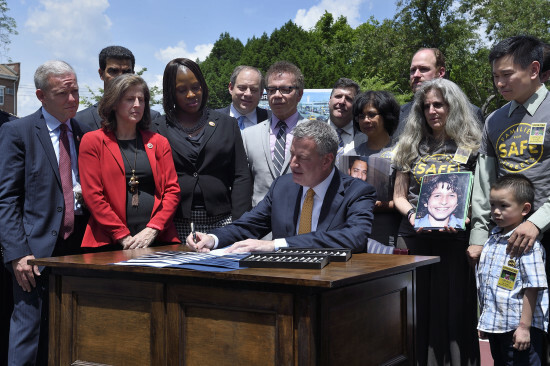 In his ongoing effort to eliminate traffic fatalities through Vision Zero, New York City Mayor Bill de Blasio has signed 11 new traffic safety bills. According to Streetsblog, the bills “suspend the licenses of dangerous taxi drivers, require the installation of 20 mph Slow Zones, and make it a misdemeanor to strike a pedestrian or cyclist with the right of way, among other changes.” These bills were signed at PS 152 in Queens, where 8-year-old Noshat Nahian was struck and killed by a truck in December. It was at that school, one month later, where Mayor de Blasio announced his Vision Zero plan to dramatically improve street safety throughout the city. 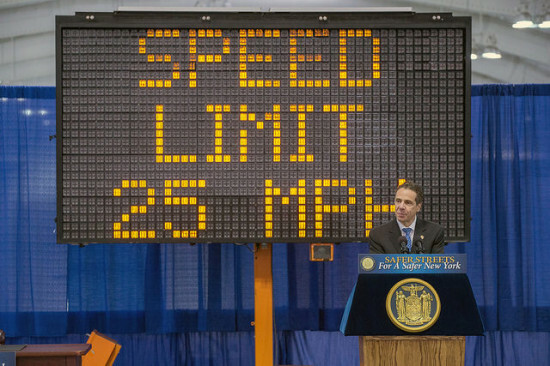 At the signing on Monday, the mayor also said that legislation recently passed by the state senate, which lowers New York City’s default speed limit from 30 miles per hour to 25 MPH, will go into effect this fall. 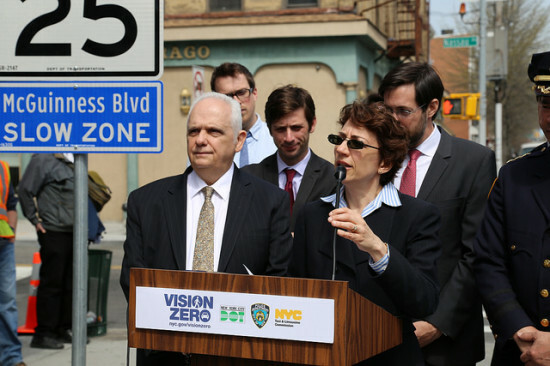 At a recent transportation forum hosted by the New York Building Congress, New York City Transportation Commissioner, Polly Trottenberg, laid-out her agenda for the city’s streets. She said implementing Mayor de Blasio’s Vision Zero plan to reduce traffic fatalities remains the department’s first priority, but made clear that, under her leadership, the NYCDOT will be doing more than safety upgrades. Trottenberg praised her predecessor, Janette Sadik-Khan, for “cracking some eggs” and fighting for bike lanes, bikeshare, Select Bus Service, and pedestrian plazas when it was not politically popular to do so. She explained that Sadik-Khan’s commitment to these types of programs—and the Bloomberg administration’s ability to realize them—makes her job that much easier. The challenge now is keeping up with the demand for new public space. According to Trottenberg, the NYCDOT is actively pursuing ways to expand these initiatives around the city—especially farther out into the boroughs. The department's wildly popular pedestrian plazas, though, could be more difficult to implement outside of Manhattan and hotspots in Brooklyn. 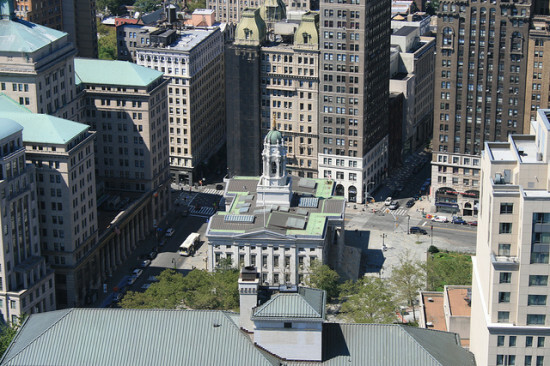 In places like Times Square and Herald Square, explained Trottenberg, the plazas' construction and maintenance can be supported by Business Improvement Districts (BIDs) and deep-pocketed interests. This type of financial backing may be harder to secure in more middle-class and working-class neighborhoods. 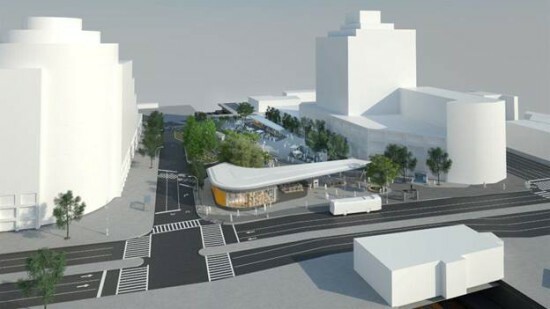 But while the most high-profile plazas are in Manhattan, this program has already been successfully implemented in parts of the Bronx, Brooklyn, and Queens. The commissioner also expressed support for congestion pricing, but did not explicitly endorse any plan. When asked about recent polling on the issue—which found modest support for the idea—she dismissed the numbers outright, saying poll respondents will always say "no" when asked about paying more for something. For congestion pricing to happen, she said, it will take politicians who can see past the politics. “If you’re waiting for a magical poll where people say, ‘yes, I’ll pay,’ it’s not going to happen,” she said. While Sadik-Khan broke significant ground on New York’s public space—physically and metaphorically—continuing to change the streetscape will not be easy. “We make things in New York very complicated,” said Trottenberg. A big reason for that is what she called the “Byzantine nature” of how the city’s infrastructure is divvied up between agencies and jurisdictions. It can be difficult, even for her, to know who oversees what road or bridge, and why exactly that is. Still, the city is in a much better place to make the case for public space than it was just a few years ago, back during the infamous bike lane wars of 2011. Mayor Bloomberg and Commissioner Sadik-Khan blazed the path, and now their successors seem intent to pave it forward. Mayor de Blasio’s Vision Zero is coming to another dangerous New York City corridor. 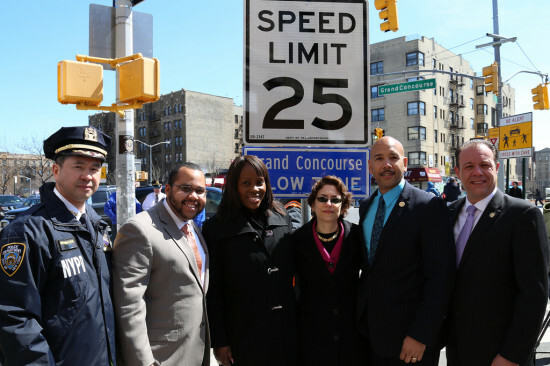 NYC Department of Transportation Commissioner Polly Trottenberg and city officials announced that the Grand Concourse in the Bronx will become the second of the city’s 25 planned “arterial slow zones.” The speed limit on more than five miles of the busy road will be lowered to 25-miles-per-hour, and traffic signals will be retimed to protect pedestrians. The announcement comes weeks after an eight-mile stretch of Atlantic Avenue in Brooklyn and Queens was given the same treatment. With Bill de Blasio making traffic regulation a priority of his fledgling administration, new visualizations of traffic injuries across New York City illustrate what the new mayor is up against in attempting to make such incidents a thing of the past. Statistician and Pratt professor Ben Wellington has used open data documenting traffic fatalities and cyclist injuries to generate heat maps of where in the city such events tended to occur in 2013. The resulting images, published on Wellington's blog I Quant NY, paint a somewhat grim image. A map that simply locates each of last year's 3800 reported cyclist injuries is so swarmed as to be rendered largely uninformative when zoomed out. The heat map generated from this diagram points to the Lower East Side of Manhattan and its cross-river neighbor, Williamsburg, as accident hotbeds. Despite these clear visual trends, such developments do not necessarily indict these two areas as more explicitly dangerous for bikers and then other parts of the city as they do not incorporated ridership density. Thus it is possible that these neighborhoods appear swathed in red simply because their streets play host to a higher amount of two-wheeled traffic than other portions of the city. 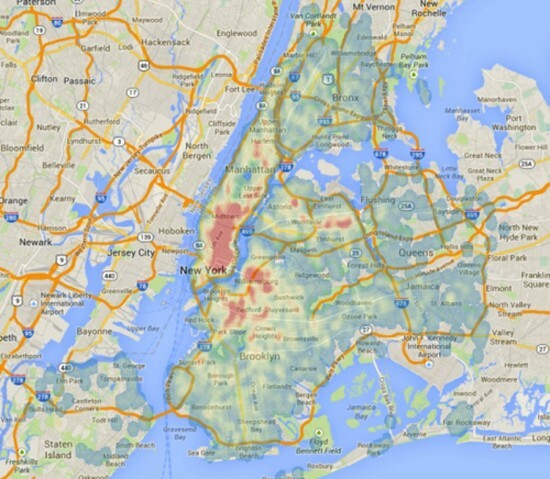 Williamsburg maintains its scarlet presence in a map depicting 2013 traffic deaths. The East Side makes a slightly less conspicuous appearance while northern parts of Manhattan and the Bronx also reveal a proclivity for such incidents. Wellington identifies Brooklyn's Broadway, Queens Boulevard, and Grand Concourse in the Bronx as particularly deadly roadways. If the mayor gets his wish, generating 2014's iterations of these maps will be a far easier task. Nonetheless the images only reinforce the idea that Vision Zero—and the heat-free maps it would create—appears to be quite a lofty goal. After promising to “end the tragic and unacceptable rash of pedestrian deaths” in his State of the City speech, New York City Mayor Bill de Blasio has officially unveiled his “Vision Zero Action Plan.” On Manhattan’s Upper West Side, near an area where three pedestrians have been killed in the past month, the mayor promised to address the scourge of traffic fatalities across the city. 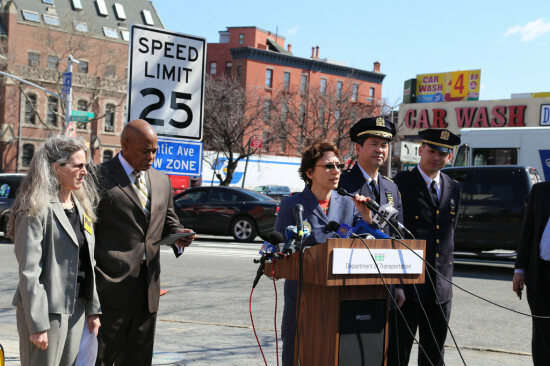 Mayor de Blasio was joined by Department of Transportation Commissioner Polly Trottenberg and Police Commissioner Bill Bratton as he laid-out the sobering statistics on traffic-related fatalities. “Being struck by a car is the leading cause of injury-related death for children younger than 15,” said de Blasio. “It’s the second leading cause of injury-related death for our senior citizens.” And, according to the most recent data, the mayor said there were nearly as many traffic fatalities in New York City as there were homicides last year. The “Action Plan” includes 63 specific initiatives that will span across many city agencies, from the NYPD to the Taxi and Limousine Commission to the Department of Health and Mental Hygiene. The plan proposes redesigning dangerous streets, adding more “slow zones” across the city, and increasing traffic enforcement with more red light and speeding cameras. The most notable part of the plan is likely the mayor’s goal to reduce the city speed limit from 30 miles per hour to 25. This, initiative, though would have to be approved by the State Legislature in Albany. What is not included in this plan is a city-wide crackdown on jaywalking. Tickets issued for jaywalking have risen dramatically under de Blasio, but the mayor says that does not reflect a larger initiative. While dispelling the notion that he is out to get jaywalkers--which has inspired some provocative headlines--the mayor defended precinct commanders' right to issue tickets they deem appropriate. “[The Action Plan] is about much more than speed bumps and the issuing of violations,” said de Blasio. “It’s also about all of us taking greater responsibility every time we get behind the wheel, and every time we step out on the street. Our lives are literally in each other’s hands.” But just two days after the mayor called for safer streets, his own NYPD-driven caravan was caught speeding and blowing through stop signs by CBS 2.